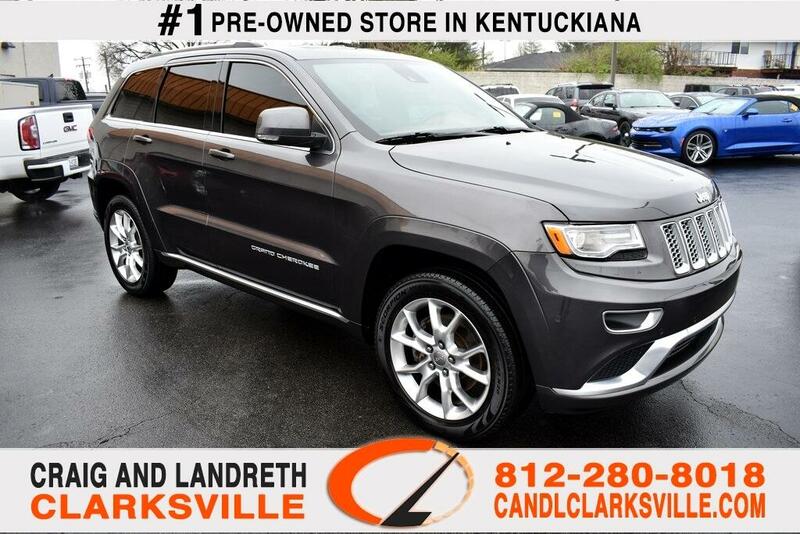 CERTIFIED BY CARFAX - NO ACCIDENTS 2015 JEEP GRAND CHEROKEE SUMMIT ** THIS JEEP IS IN SHOWROOM CONDITION INSIDE AND OUT AND THE SERVICE RECORDS ARE IMPECCABLE..... COMES WITH A PHENOMENAL PREVIOUS OWNER RECOMENDATION ** 4X4/4WD/AWD ** 5.7L HEMI ** 8.4-INCH TOUCHSCREEN ** HEATED AND COOLED LEATHER SEATS ** HEATED STEERING WHEEL ** REAR ENTERTAINMENT ** NAVIGATION ** ADAPTIVE CRUISE CONTROL ** REMOTE START ** BLINDSPOT MONITOR ** PANORAMIC SUNROOF ** PREMIUM HARDON KARDON AUDIO ** LOCAL TRADE ** NON-SMOKER VEHICLE AND HAS BEEN GARAGE KEPT SINCE DAY ONE AND IT REALLY DOES SHOW ** SUPER CLEAN CARFAX ** TOO MANY OPTIONS TO LIST ** YOU WILL NOT BE DISAPPOINTED WITH ANYTHING ON THIS VEHICLE! ANY QUESTIONS CALL RICHARD SPAN, JAKE SMITH, OR JIMMY SMITH JR AT 812-280-8018!! WE'VE NEVER LOST A DEAL WHEN IT CAME TO PRICE OR QUALITY!! GRAND CHEROKEE HAS BEEN INSPECTED BY OUR SERVICE DEPARTMENT WHO COMPLETED A 110-POINT REVIEW TO ENSURE QUALITY AND DID ALL THE ROUTINE SERVICE. WE HAVE THE CLEANEST PRE-OWNED VEHICLES IN KENTUCKIANA! LET US SHOW YOU THE DIFFERENCE. Fresh oil change, White glove detailed, 110 point safety inspection, Bluetooth, USB, Heated Seats, Cooled Seats, Keyless Entry, Remote Start, Rear View Camera/ Backup Camera, Navigation System, Sunroof/Moonroof, Panoramic Moonroof, Satellite Radio/ Sirius XM, Blind Spot Monitor, Adaptive Cruise Control, Forward Collision Warning, Push Button Start, Keyless Ignition, Leather Seats, 2nd Row Bench Seating, Parking Sensors, Parking Assist, Towing Package, 4WD, All Wheel Drive, Premium Audio, Automatic Emergency Braking, Keyless Start, Memory Seat, Premium Sound System, Rear Seat Entertainment, Non-Smoker, Local Trade, Lots Of Options, Backup Camera, Premium Package, Premium Plus Package, Premium Sound Package, Premium Wheels, Technology Package, Tow Package, Trailer Package, HomeLink, Certified. Certified by CarFax., Summit Package, 4WD, 8.4" Touchscreen Display, Body Color Door Handles, Body Color Exterior Mirrors, Body Color Sills w/Platinum, Body Color/Platinum Front Fascia, Body Color/Platinum Rear Fascia, Gloss Black Grille-Platinum Chrome, GPS Antenna Input, Platinum Badge, Platinum Series Group (Regional), Platinum Strip Tail Lamp, Power windows, Quick Order Package 28R, Radio: Uconnect 8.4 NAV, Remote keyless entry, Steering wheel mounted audio controls, Wheels: 20" x 8.0" Satin Carbon.